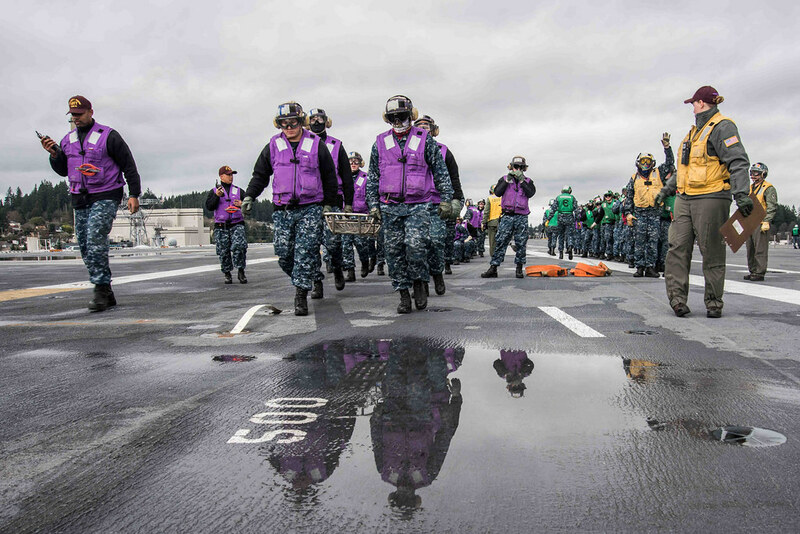 SAN DIEGO - Sailors aboard USS John C. Stennis (CVN 74) completed their Command Assessment for Readiness and Training (CART) phase II, Jan. 25. The four-day evaluation assesses a ship’s ability to respond to carry out a variety of mission areas, including responding to casualties across various warfare areas. A team of about 40 personnel from Afloat Training Group (ATG) arrived on the ship evaluate the ship’s preparedness. ATG San Diego performed the assessment using more than 300 Training Assessment Cards. The cards specify the actions the crew should take during damage control scenarios, medical casualties, and various other warfare areas scenarios. This cumulates in a final score that grades the ship’s overall procedural compliance and casualty response proficiency in a training environment. “We’re here not only to critique, but also give guidance and assess from an outside perspective,” said Lt. Cmdr. Freddie Koonce, carrier training liaison officer for all West Pacific aircraft carriers. For John C. Stennis, CART II is an important tool as it continues its training cycle. “It’s really important because it gives us a baseline of where we are deficient. It shows us what we need to work on to make sure the crew is well-rounded and able to combat casualties safely so everyone can go back home,” said Chief Damage Controlman Matthew Wierson. With the successful completion of CART II, John C. Stennis will continue preparing for Tailored Ships Training Availability and Final Evaluation Problem as the ship continues to certify prior to deployment.